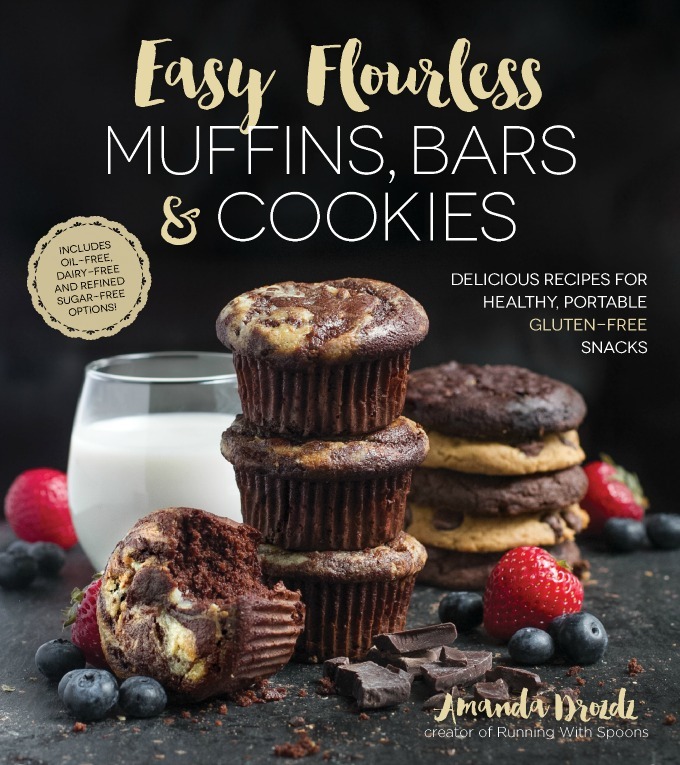 So I didn’t even realize that it’s been over two.whole.months since I posted a recipe for flourless muffins… and that’s just not okay. Remember how I promised not to include any chocolate in my next (read: this) recipe after bombarding you guys with a few back to back cocoa creations inspired by my very real (and ongoing) addiction? White chocolate doesn’t technically count since there’s no actual cocoa in it. If anything, it makes me think of some sort of candy… or at least that’s the first thing that came to mind when I opened the bag and got a whiff of that sweet, sweet aroma. At which point I may or may not have started playing one of my favourite games — one for the bowl, two for my mouth. And if white chocolate isn’t your jam? I’m betting that milk, semi-sweet, or dark work just as well. I just opted for white because it makes a killer combo and I find that the extra sweetness of the chips helps balance out the slight bitterness of the berries. 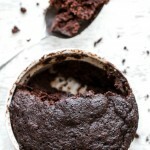 They’re slightly denser and fudgier than your average muffin because of the fact that they don’t have any flour to fluff them up, but that just puts them somewhere between a muffin and a brownie (or blondie), which is never a bad thing in my books. And they’re so ridiculously soft and tender, that they literally melt in your mouth. 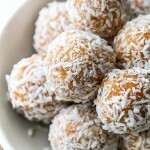 They’re also gluten-free, dairy-free, oil-free, refined sugar-free, and easily made nut-free with one simple substitution. 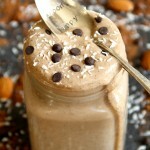 And the best part is that you only need about 5 minutes and a blender/food processor to whip them up. Well, that and some patience to get you through the 20 minutes of delicious smells wafting from your kitchen… but I promise you that the wait is more than worth it. 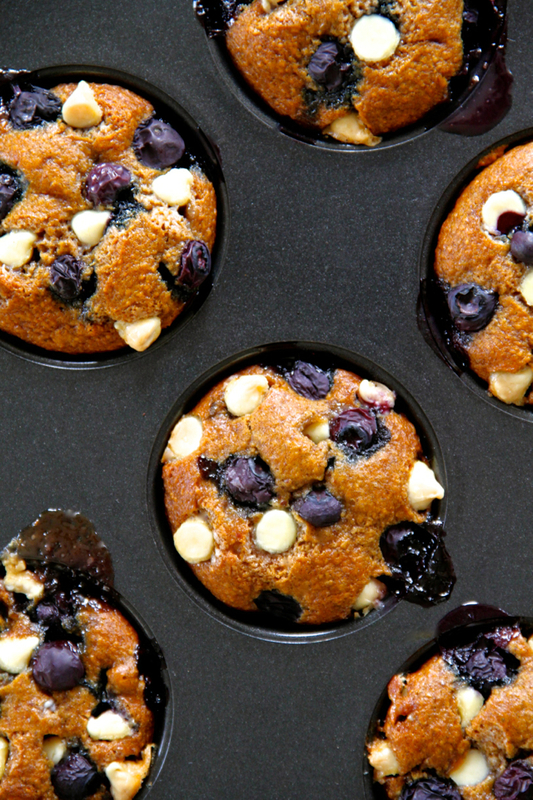 Preheat oven to 350F and prepare a muffin pan by spraying 9 cavities with cooking spray. Set aside. 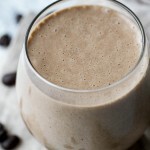 Add all ingredients except for blueberries and chocolate chips to a blender and blend on high until oats are broken down and batter is smooth and creamy. 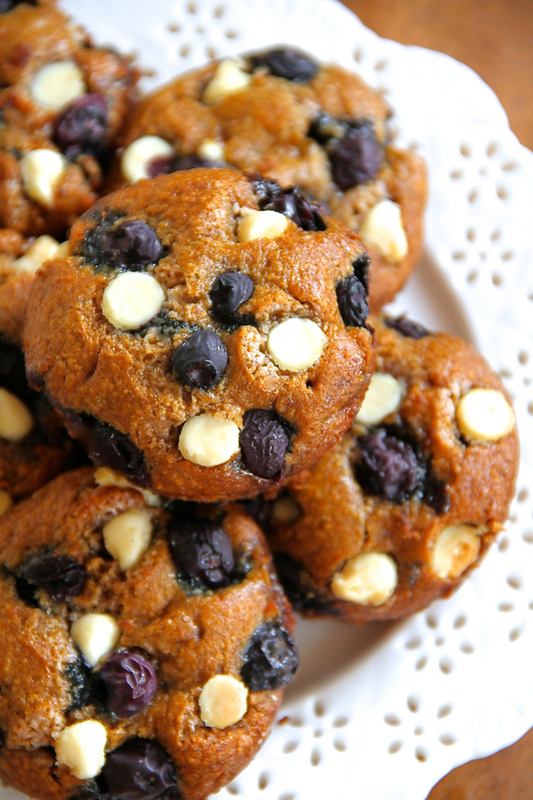 Stir in blueberries and chocolate chips by hand. 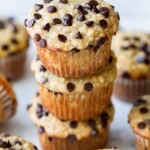 Bake for 10-12 minutes, until the tops of your muffins are set and a toothpick inserted into the middle comes out clean. Allow muffins to cool in pan for ~10 minutes before removing. Store in an air-tight container for up to a week. 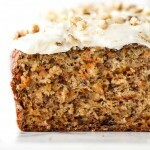 * You can easily sub this out with another nut butter, or use a sunflower seed or soy nut butter to make these nut-free. ** Make sure to use certified gluten-free oats if you need these to be gluten-free. *** The cornstarch absorbs some of the liquid that the berries release while cooking, preventing the finished muffins from becoming too soggy. You could probably also coat them with oat or coconut flour. 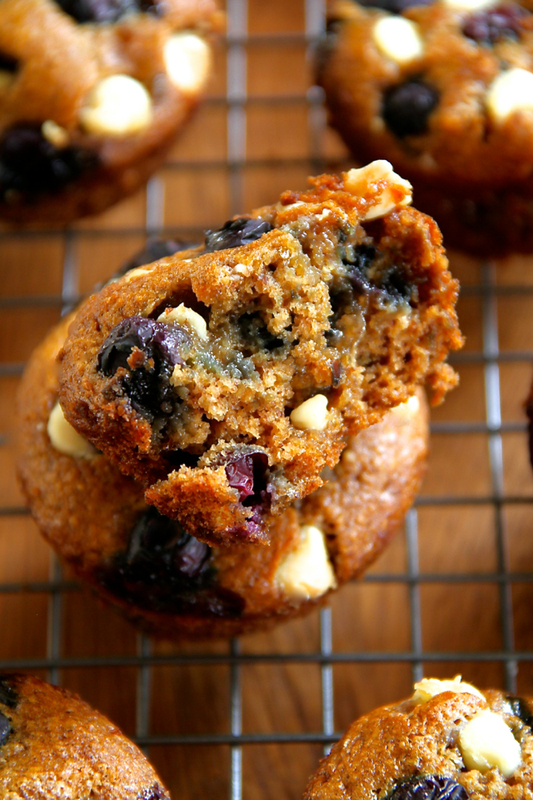 Looking for more flourless muffin recipes? Try one of these! White chocolate — love it or hate it? Anyone else suffer from online ADD? I feel like I can’t focus on anything for more than 2 mins. « . 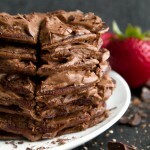 soft and chewy chocolate brownie protein bars . I don’t care for white chocolate but yes to online ADD, happens to me all of the time. I jump from screen to screen, it’s awful! Yum!! I normally don’t like white chocolate, but I could see it being really good in this recipe. I get huge online ADD. I’ll get on to google one thing, then next thing you know I’m talking wedding photos of a friend of a friend of a friend. It’s a problem. Yum! I am blueberry and I love chocolate with anything. I will try these out this weekend. Sometimes when I make the flourless muffins they don’t turn out nearly as fluffy as your look. Any tips? I find that, at least with the ones made in a blender, it’s super important to have a high-speed one that can break down the oats really well and sort of “whip” the ingredients together. If you don’t have one of those, my best tip would be to grind the oats into a flour ahead of time and then toss everything into a blender. Yum! I was wondering if those were going to be white chocolate chips or yogurt chips. I feel like I’m in the minority, but I LOVE white chocolate. These look great! Today you post these delicious morsels – and all I have is yogurt! 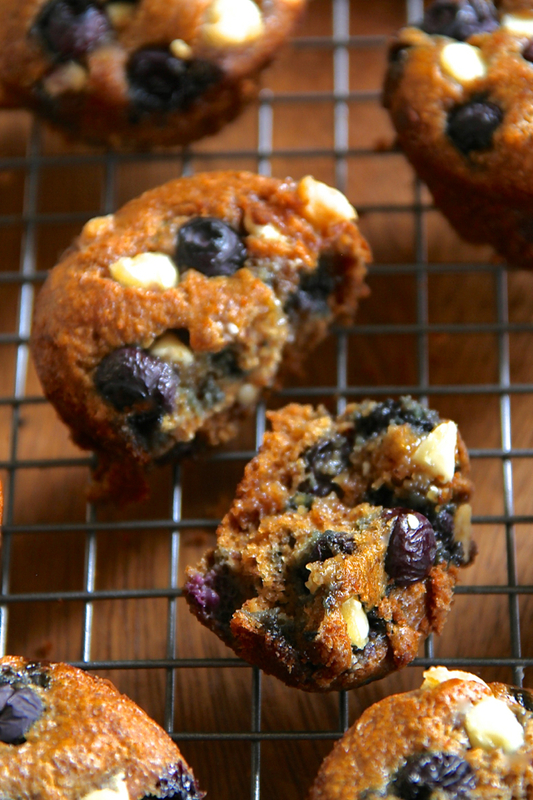 I don’t know why blueberries become tarter when baked – but I know I could eat a half dozen of these in one sitting! Online ADD is seriously the.worst.thing.ever. The day I manage to overcome it I’ll be a better blogger, reply to mails in time and, well, get more done in general. It’s one of the reason I prefer to read the newspaper rather than try to read longer articles online. Aside from that comfy-cosy feel of leaving through actual paper. 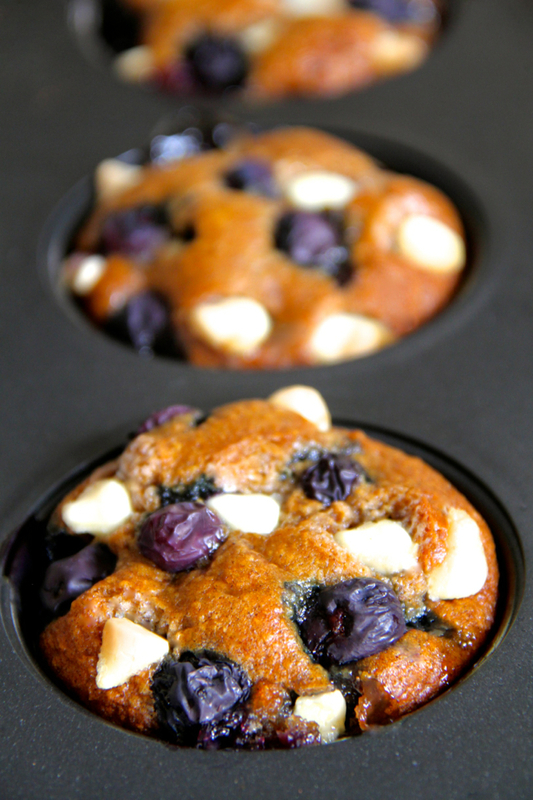 These muffins look absolutely amazing and while I’m not a huge fan of white chocolate, not even of milk chocolate, I can easily imagine how well the combination with blueberries works. You will forever be the absolute QUEEN of flourless muffins. I’m thinking that I really need to try one soon because all those positive reviews/adaptions of the original scream deeeelicious 😯 . I’ve always been worried to create a flour less muffin because I worry they won’t come out as well. They always work out for you so perhaps I will try it. Thanks for sharing! I like the flavor combination of chocolate and blueberry! Chocolate and cherry is another great flavor combo! YUM.MY. It has been ages since I had white chocolate- I really want some now! I think the combo with blueberries is absolutely divine. And technically it is not ‘chocolate’ so I think you are safe ;). Where/what brand of white chocolate chips would you recommend? The only brand I’ve been able to find around here that’s been allergy-friendly for me has been the one from Hershey’s Chipits. Seriously, white chocolate gets so much bullying. 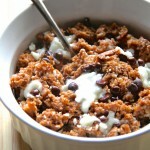 I LOVE how you used the cornstarch- That beats the oats and the cooking longer idea. I am not a fan of white chocolate. I don’t even know why! But I have major online ADD. I always have at least 10 tabs open and then I can never figure out what I am even trying to look at! Well aren’t these pretty! I like white chocolate covered pretzels, but white chocolate on its own…not so much…ADD online all the time. I have so many tabs open and then thoughts come up and I open another one…Oh well! I haven’t tried white chocolate enough to define my relationship yet, but any time of chocolate is usually a winner! These look absolutely perfect and have me drooling all over my keyboard! Ohhh my, gimme! 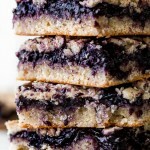 That blueberry + white chocolate combination just has to be fabulous. Can’t wait to give these a try! 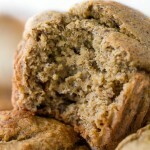 I love your flourless blender muffin recipes! That’s definitely got to be tough! Just try to keep in mind that things won’t always be that way, and that it’ll be more than worth it in the long run! ONLINE ADD = ME. I keep opening up tabs, music, different blog posts, emails, videos. I need to take a chill pill. 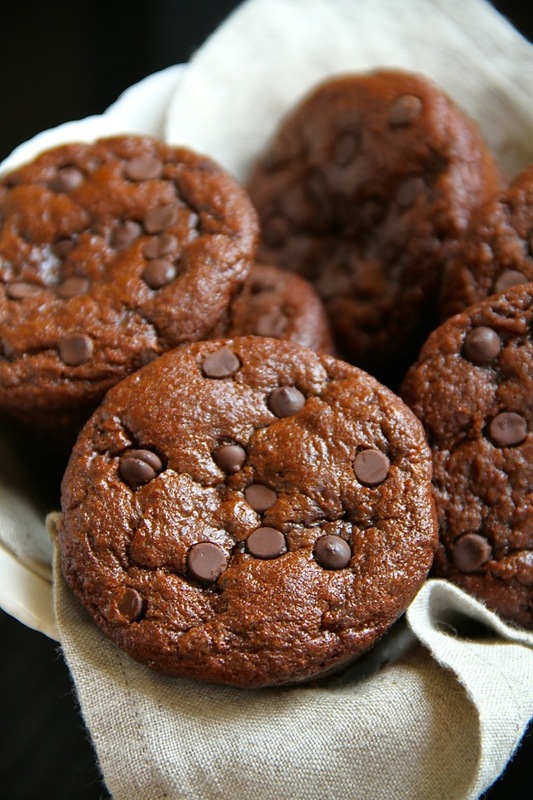 Your flourless muffins always look divine (even the chocolate ones 😉 ). I like white chocolate, but I wouldn’t go out of my way to get something with white chocolate. These though…might change my mind. Oh, the whole white chocolate vs. dark chocolate debate! I do love dark chocolate on its own, but white chocolate is so good in recipes. 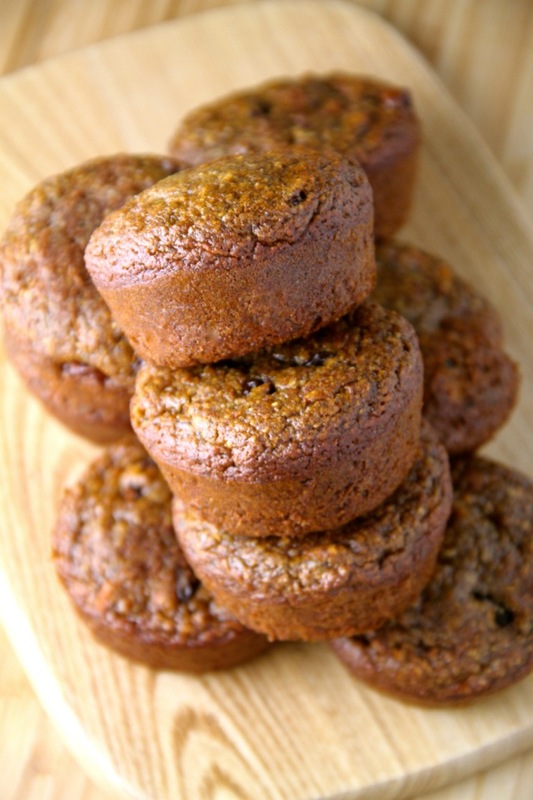 Like these delicious looking muffins for example! And peppermint bark. Totally out of season, but my favorite candy. 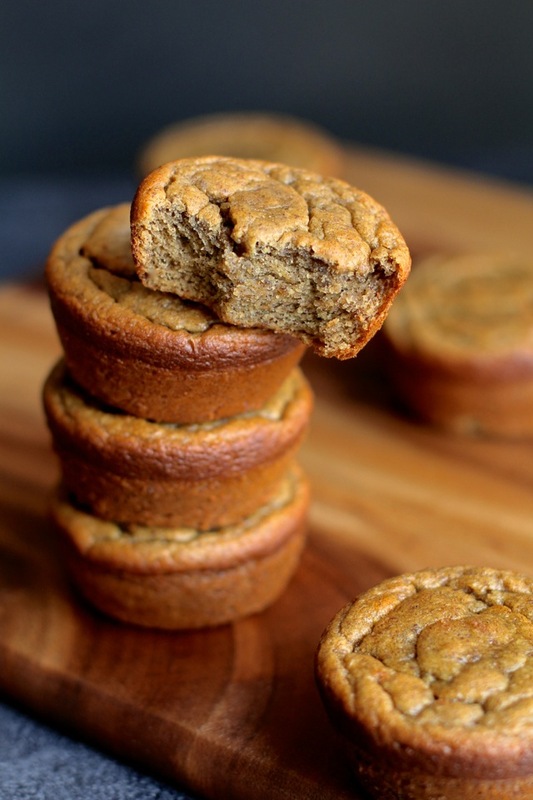 Hooray for flourless muffins – these look divine and hadn’t thought of making some grain free one with almond butter so define going to give this a coo and use creamed coconut instead of white chocolate 🙂 Yum!! These look divine! I’m on the hunt for good vegan white chocolate chips. It’ll be the best day ever when I can add those to my muffins! That’s so awesome–thank you so much for sharing that link! blueberries and white chocolate will forever be one of my favourite combos. So good! I usually throw them in cookies, but I like the idea of going the muffin route. And I almost always have 10+ tabs open at once, so I definitely feel you on the online ADD thing. Amanda these look so beautiful and delicious!!! Wow!!! They are really calling my name! I love these. You know me; I’m going for the fruity dessert or muffin over the chocolate one, all day, every day so I very much appreciate your recent blueberry kick. 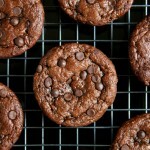 I’ve got a bundle stashed in my freezer and a gluten free friend so I promised to make him some of these. Thanks for the recipe love. How long do you think these would take to cook if baking them in a mini muffin pan instead of a regular sized one?? Do you think i could bake in a 8×8 cake dish? If so, how long do you think it should bake? Looks delicious!